PREMIUM 1 1/2'' (38mm) Round Washer w/ Hole Stamping/Engraving Blank, 22g Stainless Steel - Shiny Mirror Finish on all Surfaces. PREMIUM 1 1/4'' (32mm) Round Washer w/ Hole Stamping/Engraving Blank, 22g Stainless Steel - Shiny Mirror Finish on all Surfaces. PREMIUM 1'' (25mm) Round Washer w/ Hole Stamping/Engraving Blank, 22g Stainless Steel - Shiny Mirror Finish on all Surfaces. PREMIUM 1'' x 1/2'' (25mm x 13mm) Round Heart Hole Washer w/ Hole Stamping/Engraving Blank, 22g Stainless Steel - Shiny Mirror Finish on all Surfaces. PREMIUM 3/8'' (10mm) Round w/ Hole Stamping/Engraving Blank, 22g Stainless Steel - Shiny Mirror Finish on all Surfaces. PREMIUM 7/8'' (22mm) Rose Gold Color Round w/ Hole Stamping/Engraving Blank, 22g Stainless Steel - Durable Rose Gold Color Titanium Coated Shiny Mirror Finish on all Surfaces. PREMIUM 7/8'' (22mm) Yellow Gold Color Round w/ Hole Stamping/Engraving Blank, 22g Stainless Steel - Durable Yellow Gold Color Titanium Coated Shiny Mirror Finish on all Surfaces. PREMIUM 3/8'' (10mm) Rose Gold Color Round w/ Hole Stamping/Engraving Blank, 22g Stainless Steel - Durable Rose Gold Color Titanium Coated Shiny Mirror Finish on all Surfaces. PREMIUM 3/8'' (10mm) Yellow Gold Color Round w/ Hole Stamping/Engraving Blank, 22g Stainless Steel - Durable Yellow Gold Color Titanium Coated Shiny Mirror Finish on all Surfaces. PREMIUM 1/2'' (13mm) Round w/ Hole Stamping/Engraving Blank, 22g Stainless Steel - Shiny Mirror Finish on all Surfaces. PREMIUM 1/2'' (13mm) Rose Gold Color Round w/ Hole Stamping/Engraving Blank, 22g Stainless Steel - Durable Rose Gold Color Titanium Coated Shiny Mirror Finish on all Surfaces. PREMIUM 1/2'' (13mm) Yellow Gold Color Round w/ Hole Stamping/Engraving Blank, 22g Stainless Steel - Durable Yellow Gold Color Titanium Coated Shiny Mirror Finish on all Surfaces. PREMIUM 5/8'' (16mm) Round w/ Hole Stamping/Engraving Blank, 22g Stainless Steel - Shiny Mirror Finish on all Surfaces. PREMIUM 5/8'' (16mm) Rose Gold Color Round w/ Hole Stamping/Engraving Blank, 22g Stainless Steel - Durable Rose Gold Color Titanium Coated Shiny Mirror Finish on all Surfaces. PREMIUM 5/8'' (16mm) Yellow Gold Color Round w/ Hole Stamping/Engraving Blank, 22g Stainless Steel - Durable Yellow Gold Color Titanium Coated Shiny Mirror Finish on all Surfaces. PREMIUM 3/4'' (19mm) Round w/ Hole Stamping/Engraving Blank, 22g Stainless Steel - Shiny Mirror Finish on all Surfaces. PREMIUM 3/4'' (19mm) Rose Gold Color Round w/ Hole Stamping/Engraving Blank, 22g Stainless Steel - Durable Rose Gold Color Titanium Coated Shiny Mirror Finish on all Surfaces. PREMIUM 3/4'' (19mm) Yellow Gold Color Round w/ Hole Stamping/Engraving Blank, 22g Stainless Steel - Durable Yellow Gold Color Titanium Coated Shiny Mirror Finish on all Surfaces. PREMIUM 7/8'' (22mm) Round w/ Hole Stamping/Engraving Blank, 22g Stainless Steel - Shiny Mirror Finish on all Surfaces. 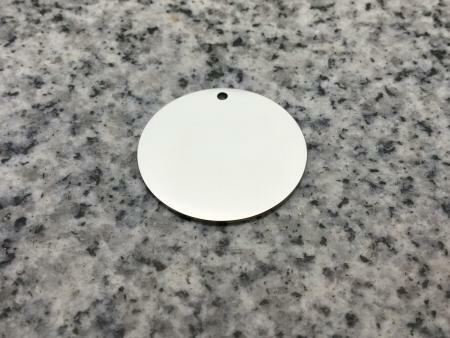 PREMIUM 1'' (25mm) Round w/ Hole Stamping/Engraving Blank, 22g Stainless Steel - Shiny Mirror Finish on all Surfaces. PREMIUM 1'' (25mm) Rose Gold Color Round w/ Hole Stamping/Engraving Blank, 22g Stainless Steel - Durable Rose Gold Color Titanium Coated Shiny Mirror Finish on all Surfaces. PREMIUM 1'' (25mm) Yellow Gold Color Round w/ Hole Stamping/Engraving Blank, 22g Stainless Steel - Durable Yellow Gold Color Titanium Coated Shiny Mirror Finish on all Surfaces. PREMIUM 1 1/4'' (32mm) Round w/ Hole Stamping/Engraving Blank, 22g Stainless Steel - Shiny Mirror Finish on all Surfaces. PREMIUM 1 1/4'' (32mm) Rose Gold Color Round w/ Hole Stamping/Engraving Blank, 22g Stainless Steel - Durable Rose Gold Color Titanium Coated Shiny Mirror Finish on all Surfaces. PREMIUM 1 1/4'' (32mm) Yellow Gold Color Round w/ Hole Stamping/Engraving Blank, 22g Stainless Steel - Durable Yellow Gold Color Titanium Coated Shiny Mirror Finish on all Surfaces.